Roger’s note: The entirely “unnecessary” Vietnam War cost nearly 60,000 American lives and hundreds of thousands wounded and emotionally and physically destroyed. But this doesn’t begin to approximate the cost in lives and physical destruction to the Vietnamese people. There were more than a million deaths, a large percentage civilian. Lyndon Johnson and Richard Nixon were the commanders in chief who were directly responsible for the slaughter, but Eisenhower and Kennedy served as presidents during the the early years of American political and military intervention. Of course there were many more, including the 98 senators who fell for the Bay of Tonkin hoax. My generation will well remember such warmongers as Secretary of Defence (i.e. WAR) McNamara and General Westmoreland (Waste more land). And then there is always Napalm (Dow Chemical) and Agent Orange (Dow and Monsanto). And let’s not forget the vultures of the war profiteering arms industry. The above named mass murderers will never be indicted, except perhaps by “history,” for what that’s worth. I am reminded of Crime and Punishment’s Raskolnikov’s musing about his crime of murdering a despised old money lender versus the hundreds of thousands killed in Napoleon’s wars. A single mother convicted of shop lifting to feed her children will suffer more at the hands of the criminal justice system than than the astute politicians, military and corporate elites mentioned above. I don’t know why, but this somehow offends my sense of justice. And why does all this seem not just a matter of history, but just as relevant today? HOI AN, VIETNAM. “I believe that history will record that we have made a great mistake,” Sen. Wayne Morse (D, OR) declared fifty years ago this week. He was referring to congressional passage of the Gulf of Tonkin Resolution, the decisive step into one of the greatest tragedies in American history. That resolution would be used for nearly a decade by Presidents Lyndon B. Johnson and Richard M. Nixon as authorization to conduct war in Vietnam. As Johnson was moving to launch retaliatory airstrikes against North Vietnam on August 4, reports reached the Pentagon from the scene off the coast of North Vietnam that there was serious doubt that an attack had occurred and from Admiral Ulysses S. Grant Sharp, Jr., at Pacific Command in Hawaii, suggesting that “a ‘complete evaluation’ be undertaken before any further action.” There is no indication that Defense Secretary Robert S. McNamara informed the President of these communications during the crucial hours when the airstrikes were being set in motion.A 2000 National Security Council historical study reached an unambiguous conclusion about the alleged North Vietnamese attack on August 4: “No attack happened that night.” But an event that didn’t happen led to a resolution that served as the concept sketch for the script of a major tragedy. Fifty years later, the magnitude of that mistake is unmistakable in Vietnam. VIETNAM AND CHINAAmong the reasons given for undertaking the war, the most prominent were to block the expansion of Chinese influence into Southeast Asia and to oppose communism. What was needed to accomplish the first objective was a strong, unified Vietnam. The Vietnamese have hated China for two thousand years, and having a communist government would not alter that basic fact in any way. Ho Chi Minh was by far the best bet to achieve this American goal.Less than four years after Hanoi’s reunification of Vietnam in 1975, the Communist regime was engaged in a brief but bloody border war with its putative comrades from China. And currently tensions between the two countries over islands in the South China Sea (Vietnam rejects that name and calls it the Eastern Sea) are high. Vietnam and the United States find themselves virtual allies in opposing Chinese expansionism. As for the other main war aim, how communist is Vietnam in 2014?There is a store in Hanoi called “Shop Aholic.” There must be steel cables restraining the preserved body of Ho Chi Minh so it doesn’t spin in its glass coffin in the nearby mausoleum. On a walk in Saigon–its current official name notwithstanding, it is not now and never has been Ho Chi Minh’s city–from Notre Dame down Dong Khoi (the famous Rue Catinat in the days of the French Empire, when it was considered Saigon’s Champs Ãlysees) to the Hotel Continental, the Opera House, and beyond, one passes all the familiar ration outlets of a communist country: Cartier, Versace, Dior, Piaget, Hermes, Louis Vuitton, Rolex . . . . “Dong Khoi” means “Total Uprising Street.” The total uprising taking place along it and throughout Vietnam is an explosion of capitalism. When one visits the still more-or-less-communist country of Cuba, among the many indelible impressions is the nearly complete absence of trucks on the highways. They have no products to move around. Has anyone ever seen “Hecho en Cuba” on anything? They make, in a word, nada. Superimpose the roads in Vietnam on those in Cuba and the result would be a chiaroscuro painting. Vietnam’s highways are clogged with trucks moving goods around, reflecting the entirely market-based economy in this nominally socialist country.If they look at many aspects of Vietnam today, conservative Republicans in the United States might see the paradise of which they dream. This “socialist” nation has a paddle-your-own-canoe-or-sink economy. There is no welfare, no minimum wage, no unemployment insurance, no national healthcare, no old-age pensions for most people, no free education beyond middle school …. Ho Chi Minh’s countenance appears everywhere in contemporary Vietnam, benevolently smiling upon policies that he strongly opposed. It is much like the situation with many “Christians” in the United States who do the opposite of what Jesus taught. The farther self-identified followers get from the teachings of their supposed leader, the louder they proclaim his name. 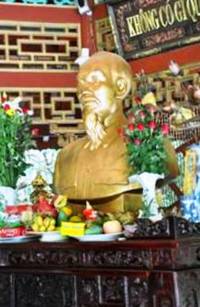 Uncle Ho has been deified–to the point of being portrayed like the Buddha on a lotus blossom. But when it comes to actual economic practice in Vietnam today, the altars at which worship takes place are those of William Graham Sumner and Ayn Rand. But outside the economic realm the role of government is large. Vietnam remains a one-party political system in which corruption is rife and basic freedoms are restricted. The Vietnamese receive none of the benefits of positive government, but bear all the burdens of negative government. There are neither political nor economic checks and balances.A proposal was made in 2013 to change the country’s official name from the “Socialist Republic of Vietnam” back to what Ho had named it in 1945: the “Democratic Republic of Vietnam.” That would constitute a lateral move–from one wholly inaccurate name to another, equally inaccurate, one. By no stretch of the imagination is contemporary Vietnam either socialist or democratic. American policymakers in 1964 sought a Vietnam that was capitalist, would block China, and with which they could have good relations.The United States fought a war at terrible cost to achieve those ends and lost. Today, though, Vietnam is staunchly capitalist, adamantly opposed to China, and friendly to the United States. Had the war never been fought, it is highly likely that all of those ends would have been achieved at a much earlier date. What, then, was this “b*tch of a war,” as Lyndon Johnson would later call it, to which the President proposed marriage a half century ago this week, with the Gulf of Tonkin Resolution as the engagement ring, good for?Absolutely nothing. Posted by rogerhollander in History, War. 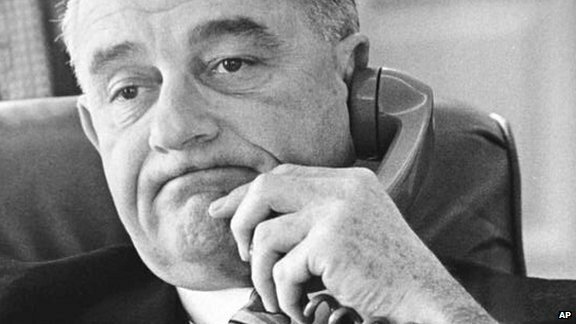 Declassified tapes of President Lyndon Johnson’s telephone calls provide a fresh insight into his world. Among the revelations – he planned a dramatic entry into the 1968 Democratic Convention to re-join the presidential race. And he caught Richard Nixon sabotaging the Vietnam peace talks… but said nothing. After the Watergate scandal ta ught Richard Nixon the consequences of recording White House conversations none of his successors have dared to do it. But Nixon wasn’t the first. The final batch of tapes released by the LBJ library covers 1968, and allows us to hear Johnson’s private conversations as his Democratic Party tore itself apart over the question of Vietnam. Tens of thousands of anti-war protesters clashed with Mayor Richard Daley’s police, determined to force the party to reject Johnson’s Vietnam war strategy. As they taunted the police with cries of “The whole world is watching!” one man in particular was watching very closely. Lyndon Baines Johnson was at his ranch in Texas, having announced five months earlier that he wouldn’t seek a second term. The president was appalled at the violence and although many of his staff sided with the students, and told the president the police were responsible for “disgusting abuse of police power,” Johnson picked up the phone, ordered the dictabelt machine to start recording and congratulated Mayor Daley for his handling of the protest. They also discussed whether the president’s helicopter, Marine One, could land on top of the Hilton Hotel to avoid the anti-war protesters. By the time of the election in November 1968, LBJ had evidence Nixon had sabotaged the Vietnam war peace talks – or, as he put it, that Nixon was guilty of treason and had “blood on his hands”. The BBC’s former Washington correspondent Charles Wheeler learned of this in 1994 and conducted a series of interviews with key Johnson staff, such as defence secretary Clark Clifford, and national security adviser Walt Rostow. 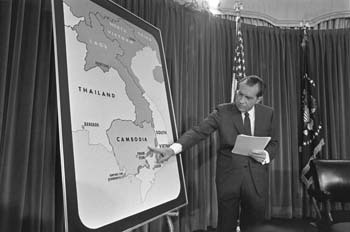 At a July meeting in Nixon’s New York apartment, the South Vietnamese ambassador was told Chennault represented Nixon and spoke for the campaign. If any message needed to be passed to the South Vietnamese president, Nguyen Van Thieu, it would come via Chennault. 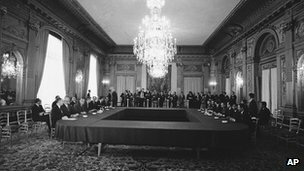 In late October 1968 there were major concessions fro m Hanoi which promised to allow meaningful talks to get underway in Paris – concessions that would justify Johnson calling for a complete bombing halt of North Vietnam. This was exactly what Nixon feared. He was also told why. The FBI had bugged the ambassador’s phone and a transcripts of Anna Chennault’s calls were sent to the White House. In one conversation she tells the ambassador to “just hang on through election”. In a series of remarkable White House recordings we can hear Johnson’s reaction to the news. The president did let Humphrey know and gave him enough information to sink his opponent. But by then, a few days from the election, Humphrey had been to ld he had closed the gap with Nixon and would win the presidency. So Humphrey decided it would be too disruptive to the country to accuse the Republicans of treason, if the Democrats were going to win anyway. Nixon ended his campaign by suggesting the administration war policy was in shambles. They couldn’t even get the South Vietnamese to the negotiating table. The White House tapes, combined with Wheeler’s interviews with key White House personnel, provide an unprecedented insight into how Johnson handled a series of crises that rocked his presidency. Sadly, we will never have that sort of insight again. Roger’s note: it has been my opinion that in our time things really began to go “off the track” with the Nixon presidency and not with the Bush era, as many argue (of course, in a broader sense the car jumped the rail in 1492). The Nixons and the Bushes and the Obamas and the military-industrial complex behind them sacrifice lives by the hundreds of thousands, and we honor them as presidents and patriots. The cynicism behind it all is almost beyond comprehension, not to mention surreal. According to the records, Eugene Rostow, Johnson’s Under Secretary of State for Political Affairs, got a tip in late October 1968 from a Wall Street source who said that one of Nixon’s closest financial backers was describing Nixon’s plan to “block” a peace settlement of the Vietnam War. The backer was sharing this information with his banking colleagues to help them place their bets on stocks and bonds. In other words, these investment bankers were colluding over how to make money with their inside knowledge of Nixon’s scheme to extend the Vietnam War. Such an image of these “masters of the universe” sitting around a table plotting financial strategies while a half million American soldiers were sitting in a war zone was a picture that even the harshest critics of Wall Street might find hard to envision. Yet, that tip — about Nixon’s Wall Street friends discussing his apparent tip on the likely course of the Vietnam War — was the first clear indication that Johnson’s White House had that the sudden resistance from South Vietnamese President Nguyen van Thieu to Paris peace talks may have involved a collaboration with Nixon, the Republican candidate for president who feared progress toward peace could cost him the election. So, according to the speaker, Nixon was trying to convince both the South and North Vietnamese that they would get a better deal if they stalled Johnson’s peace initiative. The Rostow memos are contained in a file with scores of secret and top secret documents tracing Nixon’s Vietnam peace-talk gambit as Johnson tried frantically to stop Nixon’s blocking operation and still reach a peace agreement in the waning days of his presidency. 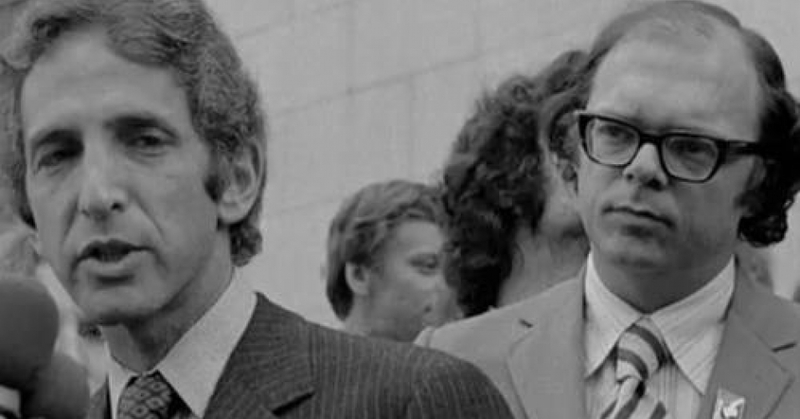 After Nixon narrowly prevailed in the 1968 election and as Johnson was leaving the White House without a peace agreement in hand, the outgoing President instructed Walt Rostow to take the file with him. Rostow kept the documents in what he called “The ‘X’ Envelope,” although the archivists at the LBJ Library in Austin, Texas, have dubbed it the “X-File” after the once popular TV series. Rostow’s “‘X’ Envelope” was not opened until 1994, which began a process of declassifying the contents, some of which remain secret to this day. After Johnson’s peace initiative failed, the Vietnam War dragged on another four years, leading to the deaths of an additional 20,763 U.S. soldiers, with 111,230 wounded. An estimated one million more Vietnamese also died. Posted by rogerhollander in Education, Racism. 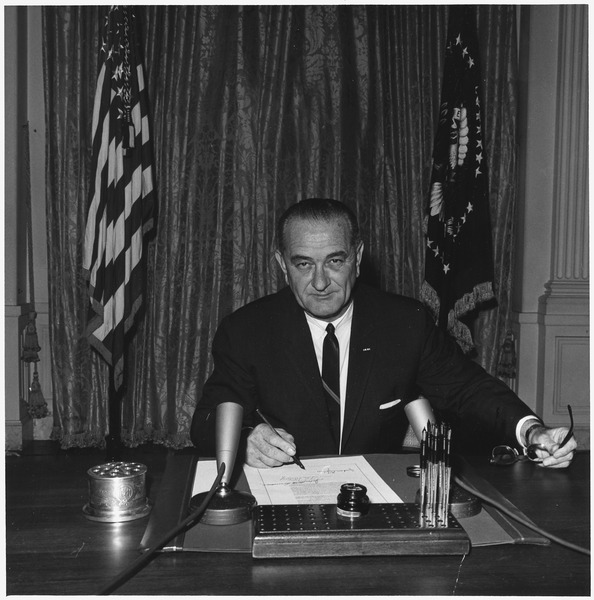 Prior to passage of the Elementary and Secondary Act (ESEA) in 1965, a savvy Lyndon Johnson, who knew the South would never willingly desegregate schools, crafted the federal legislation so that large sums of money would go to any of the segregated systems of the South that would comply with the Civil Rights Act of 1964, which, of course, banned racial discrimination in any public institution receiving federal funds. This strategy of carrot (ESEA) following stick (Civil Rights Act) worked like a charm, and the “segregation now, segregation forever” crowd quietly resolved to accept the federal millions and, in doing so, reluctantly complied with the Supreme Court’s mandate handed down in the unanimous 1954 Brown decision, which had been largely ignored in the South. Then, following the 2008 calamity brought on by Wall Street’s casino capitalists, Education Secretary Arne Duncan used a newfound power of $4. 35 billion in federal discretionary Race to the Top (RttT) grants to sidestep the legislative gridlock holding up changes to NCLB that were being advanced by the corporate foundations and the Business Roundtable: 1) uncapped expansion of charter schools (minus any regulations or incentives for maintaining diversity or inclusion of special populations or ELL), 2) proliferation of testing data tracking systems, 3) more value-added standardized testing, and 4) teacher evaluations based on student test scores. Any state or LEA that wanted to get a chunk of Duncan’s 4 billion dollar carrot would have to comply with these four conditions. 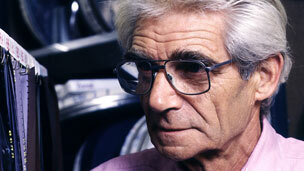 Jim Horn is Associate Professor of Educational Leadership at Cambridge College, Cambridge, MA. He is also an education blogger at Schools Matter and has published widely on issues related to social justice in education. Posted by rogerhollander in Media, Vietnam, War. When Richard Nixon’s presidential library this week released tapes of him making bigoted remarks about blacks, Jews and various ethnic groups, major American news outlets jumped at the juicy details, recounting them on NBC’s Nightly News, in the New York Times and elsewhere. The President also stressed the stakes involved, noting that the movement toward negotiations in Paris had contributed to a lull in the war’s violence. Faced with Johnson’s implied threat, Nixon promised to tell the South Vietnamese officials to reverse themselves and join the peace talks. However, the die was cast for more war. Thieu could not be pressured because he had the leverage over Nixon; Thieu could go public even if Johnson didn’t. A universal health care system based on the single-payer model appears to be a bridge too far for President Barack Obama. A single-payer system, such as Medicare for everyone, would provide health care for all. President Lyndon Johnson had the courage to weigh in with all his clout to win passage of Medicare and Medicaid. President Roosevelt put all his chips on the table to win passage of the Social Security Act that makes the elderly more secure. All around the world, governments have long made medical care available for their citizens. Why not us? Obama clearly has no stomach for the political battle that any single-payer plan would ignite. So he’s endorsed a step that would allow the government to provide health insurance coverage — not health care — to eligible people. Such government-sponsored health insurance is being considered in Congress as it writes health care reform legislation. While the public plan option gets full consideration in Congress, the single-payer model has been unwelcome at the White House or on Capitol Hill. He made it clear that his idea of health care reform would allow patients to choose their own doctors and keep their own health plans. Somehow government bailouts have been more palatable for Wall Street plutocrats who happen to be needy. Obama stressed in a speech to the AMA in Chicago last week that he does not favor socialized medicine. Some 47 million Americans are uninsured — many because some employers have dropped coverage in the economic downturn. Others lack insurance because pre-existing illnesses deny them access to private insurance. There also are millions with no way to pay for soaring health insurance payments because they have lost their jobs. Nearly all Republicans and some moderate Democrats oppose any public plan option. These are the same lawmakers who receive many government-provided perks including health insurance. In his remarks to the AMA, Obama warned against “scare tactics” and “fear mongering” by opponents of the public plan option, which the President said should be available to those who have no health insurance. Obama should tear a page out of LBJ’s vote-getting manual and shame the heartless opponents. The health of all Americans is our business. Posted by rogerhollander in Barack Obama, Health. The Obama administration and the Congressional Democrats are finally hitting the inevitable wall that was bound to confront them because of the president’s congenital inability to be a bold leader, and because of the party’s toxic decades-old decision to betray its working class New Deal base in favor of wholesale corporate whoredom. The wall is health care reform, which both Barack Obama and the Democratic Party had hoped would be the ticket for them to ride to victory in the 2010 Congressional elections and the 2012 presidential election. But you cannot achieve the twin goals of reducing health care costs and providing access to health care to 50 million uninsured people, while leaving the profit centers of the current system—doctors, hospitals and the health insurance industry—in charge and in a position to continue to reap profits. Oh please. I know there are plenty of wonderful doctors who are dedicated to their patients and to patient care. But I also know plenty of doctors who have told me how half their classmates in medical school were mainly in it for the money, and that study halls and cafeterias of American med schools echo with the conversations about what can be made working in particular specialties. Not to mention the corrupt and insidious profit-sharing arrangements doctors enter into with labs, CAT-Scan and MRI test centers, pharmaceutical companies and other businesses, to earn profits by sending patients for unnecessary tests and treatments. One can only imagine what he would be saying to insurance industry executives about his “reform” plans. Because Obama and Congressional Democrats are unwilling to cut themselves off from the lucrative campaign-funding bonanza that is the health care industry, they cannot address seriously either the cost or the access crisis that plagues health care in the US, and that makes health care in this country cost 20 percent of GDP—twice what it costs in any other modern nation on a per capita or GDP basis, and that still leaves one in six Americans without ready access to even routine health care. The answer to this crisis is obvious: a single-payer “socialized” system, in which you still have private doctors, and private or publicly run hospitals, but where the government sets the payment rates for treatment, and provides all compensation to health care providers. Obama’s unwillingness to lead on this issue will doom his health care plan. There is obviously no way Congress is going to shake off its corrupt leech-like attachment to corporate sponsors and their cash-spreading lobbyists, but had the new president wanted to make a historic mark and cruise to victory in 2012, he could have, like President Lyndon Johnson before him in his campaign for Medicare in 1965, put himself solidly behind a single-payer plan and made the case that it could cut America’s collective health bill in half while opening the door to every American. Instead, he’s likely to end up with worse than nothing—that is with even more uninsured Americans come 2012, and with health care costs moving up as a share of GDP—and could well find himself out of a job. The policy that his handlers, like White House Chief-of-Staff Rahm Emanuel, had conceived of as Obama’s ticket to re-election, health care reform, could well prove instead to be his Waterloo. That is if his adoption of a policy of expanded war in Afghanistan—another example of a failure to lead—doesn’t prove to be this president’s bigger policy disaster. Posted by rogerhollander in Barack Obama, Pakistan, Uncategorized. MARILYN YOUNG: Yeah, but that’s, that’s you know, he’s read history. He should at least or he should have been very familiar with the Johnson administration. That’s exactly the trap that Johnson walked into. And it’s not necessary. I have this odd notion that the American public is actually, in the main, adult enough to listen and think and to respond to a president who says, I’m going to tell you what’s going on. For eight years there has been miasma, lies, deception, bizarre behavior. We’re going to change that and not just economically and not just domestically. But we’re really going to see what we’re doing everywhere. That means I did not approve a military move I was urged to approve because I want to know what I’m doing. And I’m sure my fellow citizens will join me in wishing to know what it is the United States is doing militarily before it does it. Very often in the White House, the most momentous decisions are, at the time, the least dramatic, the least discussed. And they don’t make news, or history, until much later, when their consequences bubble to the surface downstream. There are observers who think that could prove to be the case with a decision made within hours of Barack Obama’s swearing in last week. It started as a few lines in wire reports – a bit of buzz on the web – then a story here and there in the weekend papers. Unmanned American drones like this one, called Predators, honing in on villages in Pakistan, near the border with Afghanistan, striking like silent intruders in the night, against suspected terrorists. Early accounts of casualties varied from a dozen to more than 20 dead and wounded. One Pakistani security official told THE WASHINGTON POST that perhaps ten insurgents had been killed, maybe even a high value target, a senior member of al Qaeda or the Taliban. Then the TIMES of London quoted locals who said “… three children lost their lives” when the missiles destroyed several homes. Since last August, 38 suspected U.S. missile strikes have killed at least 132 people in Pakistan, where allegedly we are not at war. 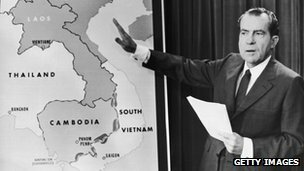 BILL MOYERS: After an encounter in the Gulf of Tonkin between American destroyers and North Vietnamese torpedo boats, President Lyndon Johnson ordered bombing raids over North Vietnam. BILL MOYERS: LBJ said we want no wider war, but wider war is what we got, eleven years of it. Now military analysts and historians, including my two guests are wondering aloud – could Afghanistan become “Obama’s war,” a quagmire that threatens to define his presidency, as Vietnam defined LBJ’s? Marilyn Young is a professor of history at New York University. She’s published numerous books and essays on foreign policy, including THE VIETNAM WARS, 1945-1990, THE NEW AMERICAN EMPIRE and IRAQ AND THE LESSONS OF VIETNAM. She is the co-editor of a collection of essays to be released next month titled BOMBING CIVILIANS: A TWENTIETH-CENTURY HISTORY. Pierre Sprey is a former Pentagon official, one of Defense Secretary Robert McNamara’s famous “whiz kids” who helped design and develop two of the military’s most successful airplanes, the F-16 Falcon Fighter and the A-10 Warthog Tankbuster. But in the late 1970s, with a handful of Pentagon and congressional insiders, Sprey helped found the military reform movement. They risked their careers taking issue with a defense bureaucracy spending more and more money for fewer and fewer, often ineffective weapons. BILL MOYERS: Marilyn, what did you think last weekend when four days into the Obama administration we read those reports of the strikes in Pakistan? MARILYN YOUNG: My heart sank. It absolutely sank. It had been very high. I had been, like I think the rest of the country, feeling immensely encouraged and inspired by this new administration and by the energy and vigor with which he began. And then comes this piece of old stuff on approach to a complicated question that in comes in the form of a bomb and a bomb in the most dangerous of all places. And, yeah, my heart sank, literally. BILL MOYERS: Our military, Pierre, says it’s sure that it’s striking militants in Pakistan and Afghanistan. And that they’re not targeting civilians. Can they be sure? From your experience, can they be sure? PIERRE SPREY: I’m sure that their purpose is to strike militants. I have no doubt of that whatsoever. But with the weapons they use and with the extremely flawed intelligence they have. PIERRE SPREY: I’d be astonished if one in five people they kill or wound is in fact, a militant. BILL MOYERS: What do you mean “flawed intelligence”? PIERRE SPREY: You can’t tell with a camera or an infrared sensor or something whether somebody’s a Taliban. In the end, you’re relying on either, you know, some form of intercepted communications, which doesn’t point at a person. It just, you know, points at a radio or a cell phone or something like that. Or, most likely, you’re relying on some Afghani of unknown veracity and unknown motivation and who may, may very well be trying to settle a blood feud rather than give you good information. BILL MOYERS: But don’t these drone planes and Predator missiles provide a commander-in-chief, a President of the United States, with enormous political convenience for being able to order military action without risking American lives? PIERRE SPREY: A very dangerous option because it’s so convenient and because at home it’s politically acceptable because our boys aren’t dying on the ground, it gets us into tremendous trouble, which, of course, in general is true of bombing. PIERRE SPREY: Bombing is always politically popular relative to sending infantry and killing our boys. BILL MOYERS: Aren’t these drone planes and these Predator missiles effective? Don’t they get the bad guys, even though they might kill a few civilians? PIERRE SPREY: Their importance is enormously exaggerated, as is their glamour. A Predator is a very large radio-controlled model airplane with a 48-foot wingspan and a snowmobile motor in the back. It only goes about 80 miles an hour. And it stays up for 10, 15 hours and carries a missile. And when they launch the missile, the missile is not pinpoint accurate. You know, if it’s a house, reasonably often it hits the house it’s aimed at. And when it does, it usually kills a bunch of other people around. MARILYN YOUNG: And it’s true, you can aim at this table. But the question is who’s sitting at – well, they might want to aim at this table. But, you know, who’s sitting at the table? And you don’t know. Or actually you do want to hit Pierre but you don’t want to hit the two of us. Unfortunately, pieces of what hit him hit us. And we are severely injured or dead. But really Pierre is what you wanted and Pierre is what you got. And this is supposed to be a triumph. And it seems to me that it is a triumph in the most abstract sense. And if you are on the ground as one of these things come at you, the material meaning of being bombed becomes very clear. And that’s not ever discussed or taken into account. BILL MOYERS: The material meaning? MARILYN YOUNG: Yes. What it feels like to be bombed, not to be in the crosshairs going down but to be on the ground looking up. And the footage that we have in the sense we have of drones is of someone 10,000 miles away pushing a button and, wham, there it goes. But nobody’s sitting there on the ground looking at what happens after it goes up. PIERRE SPREY: And what happens on the ground is for every one of those impacts you get five or ten times as many recruits for the Taliban as you’ve eliminated. The people that we’re trying to convince to become adherents to our cause have turned rigidly hostile to our cause in part because of bombing and in part because of, you know, other killing of civilians from ground forces. But we’re dealing with a society here, that’s based on honor, you know? The Pashtun are very ancient people. PIERRE SPREY: Well, it’s not a tribe. It’s a nation. This is 40 million people spread across Afghanistan and Pakistan, you know, who don’t even recognize that border. It’s their land. PIERRE SPREY: There’s 40 million of them. That’s a nation, not a tribe. Within it are tribal groupings and so on. But they all speak the common language. And they all have a very similar, very rigid, in lots of ways very admirable code of honor much stronger than their adherence to Islam. PIERRE SPREY: They have to resist, you know, being invaded, occupied, bombed, and killed. It’s a matter of honor. And they’re willing to die in unbelievable numbers to do that. BILL MOYERS: Are you suggesting that these strikes could be contributed to the destabilization of Pakistan, one of our allies? MARILYN YOUNG: It’s clear that they’re doing that. I mean, there never was before an organization called Taliban in Pakistan. This didn’t exist as an organization. It does now. It’s unclear to me as well the relationship between our punitive enemy, al Qaeda, and the Taliban. That’s unclear. And it’s, it’s very unclear what American policy will be with respect to either group. Mainly what’s unclear is what our goal is in Afghanistan. It’s really unclear. PIERRE SPREY: And we failed miserably on both missions, you know? al Qaeda’s obviously flourishing, undoubtedly stronger around the world than it was when we started this in 2001. And what did we liberate the country from? We certainly caused the Taliban to withdraw. We didn’t defeat them. They withdrew. And Afghanistan turned into a battleground for warring huge, extremely violent drug gangs. All these provincial governors, all these people we call warlords euphemistically are large-scale drug gangsters. PIERRE SPREY: And the country was ripped apart by them. And that’s why the Taliban is coming back. BILL MOYERS: You saw the story in “The Washington Post” this week from Secretary of Defense Gates who says, you know, we’re not longer going to be involved with these gangsters you talk about, with a corrupt government of Karzai in Kabul. We’re going to concentrate instead on doing something about the mess you just described by waging a war that will ultimately defeat the insurgents. That was, in effect, his message. New strategy. BILL MOYERS: Involvement with the civilian government. MARILYN YOUNG: And we’ll focus on the provinces. And there is also an implication from earlier stories that there will be an effort to buy off various warlords to try and import some of what was done in Iraq into Afghanistan. The problem is the focus remains a military solution to what all the other information I have says is a political problem. So I don’t care how you slice the military tactic, so long as your notion is that you can actually deal with this in a military way, you’re just going to march deeper and deeper into what Pete Seeger used to call the Big Muddy or I guess in Afghanistan it’s pretty dry. It would be some other expression. But the point is if you can’t figure out a political way to deal in Afghanistan then you can only compound the compound mess that Pierre talked about. PIERRE SPREY: Yeah, the military approach is always and the conventional think tank approach and the General Petraeus approach is, first, we’ll establish security. PIERRE SPREY: And then we’ll fix the government. PIERRE SPREY: That doesn’t work. In fact, that’s already failed. And the more we try to fix the security situation, the more we will drive these people, particularly the Pashtun, into implacable opposition. And whether the military solution is more bombing from Predators or from F-16s or more special forces on the ground, you know, attacking villages and inadvertently killing lots of civilians, it doesn’t matter. As long as security comes first, the mission will fail because these people are sick and tired of a government that’s oppressing them and a foreigner who’s killing them. BILL MOYERS: There was a photo the other day of a protest in Pakistan, a few days after a drone attacked. The banner reads, quote, “Bombing on tribes. Obama’s first gift to Pakistan.” Now, that’s part of the blowback, isn’t it? PIERRE SPREY: That’s incredibly dangerous. PIERRE SPREY: I mean, I don’t think people in America have any sense of how dangerous that is. By bombing into those areas, those traditional Pashtun areas, that the Pakistani government long ago made a pact, you know, at the founding of the state of Pakistan to never invade those areas and to leave the Pashtun to govern themselves. And we are forcing the Pakistanis to break that pact, both on the ground with their army. And we’re breaking it by bombing the Pashtun in Pakistan. That is taking a weak and also rotten Pakistani government and crumbling it. That’s putting them on the horns of a dilemma that they don’t need. Why is that so dangerous to us? Because this is a nuclear armed country. And when they fall apart and fall into the hands of people like, people that are running Afghanistan, you could have a nuclear war with India, you know? I mean, we’re talking about not just blowback but we’re talking about catastrophe could result. MARILYN YOUNG: You know, the thing that gets me, Obama appoints George Mitchell and he says what we’re going to do is listen. What we’re going to do is figure we’re just going to listen. And in his first press interview on that Arab TV network, which was a brilliant move I thought, he talked about respect. BARACK OBAMA [SOT]: We are ready to initiate a new partnership based on mutual respect and mutual interest. MARILYN YOUNG: He used the word “respect” repeatedly. And it’s an excellent word to use and an important one. He, it’s not impossible to say we’re going to pause in Afghanistan and listen. We’re going to think about it. We’re going to figure it out. We’re not going to move militarily at this moment until we know what we’re doing. BILL MOYERS: “and killers in their own right. And we want to – we want you to approve this raid.” And suppose he had said no four days after the inauguration and that had been leaked. You know what would have happened on all of the right-wing talk radio shows in. BILL MOYERS: And maybe “The Washington Post” and editorial page and others like that. He has no backbone, right? I mean, wasn’t he in a sense, trapped by this option? PIERRE SPREY: I would applaud, I would have the utmost admiration. PIERRE SPREY: For any leader, even for a senator or congressman who had the guts to say exactly what you just said. But it’s not in the cards. And we knew it wasn’t in the cards when during the campaign Obama subscribed to the fact that we’re in a war on terror. PIERRE SPREY: This is not a war on terror. You know? And anybody who starts from the premise that it’s a war on terror is heading straight into disasters error. BILL MOYERS: I don’t understand that because George W. Bush defined this as a war on terror. And I think Obama must be using the same invocation, you know? BILL MOYERS: This is all part of the war on terror. He said it in his inaugural address. PIERRE SPREY: Yes, he said that. I was appalled. You talk about our hearts sinking. PIERRE SPREY: 9/11 was not an act of war. PIERRE SPREY: It was a criminal act. It was a simple. PIERRE SPREY: Criminal act by a bunch of lunatic fanatic violent people who needed to be tracked down and apprehended and tried exactly as you would with any other lunatic violent person, like we do with our own domestic terrorists, like the guy who bombed the Oklahoma federal building. BILL MOYERS: Federal building. Right. PIERRE SPREY: You know? Exactly the same thing we did to him is what we should have launched on a huge basis, of course, on a huge international police basis and not called it. MARILYN YOUNG: And there would have been totally international support. PIERRE SPREY: It’s not a war. PIERRE SPREY: We, by calling it a war, we have glorified al Qaeda. We have glorified the cause of violent radical Islam. All that tiny minority have become heroes. And we made them heroes. We made their propaganda. We made their case for them. BILL MOYERS: Let me read you an excerpt from the official White House statement on foreign policy under President Obama. Quote, “Obama and Biden will refocus American resources on the greatest threat to our security, the resurgence of al Qaeda and the Taliban in Afghanistan and Pakistan. They will increase our troop levels in Afghanistan, press our allies in NATO to do the same, and dedicate more resources to revitalize Afghanistan’s economic development.” There you have a very clear statement of their intentions that we’re going to concentrate on the war. And in fact by the end of this year there’ll be 60,000, not 30,000 American troops in Afghanistan. And there’s no indication the strikes, the air strikes that are killing civilians are going to stop. PIERRE SPREY: -will be useless. PIERRE SPREY: You know, the Russians at the peak of their invasion – who dealt with the Afghanis a good deal more brutally than we did – had over 150,000 and a trained a 250,000 man Afghan army. And they lost. 60,000 is a recipe for failure, defeat, and ultimately a disgraceful withdrawal by the United States. One way or another, no matter how nice a face we put on it, we’ll be kicked out of there just like we were kicked out of Vietnam. BILL MOYERS: Speaking of Vietnam, and you’ve written so much about this, we have a conversation between President Johnson and, your old boss, Secretary of Defense McNamara about bombing. Take a look at this. ROBERT McNAMARA [SOT]: If we hurt them enough it isn’t so much that they don’t have more men as it is that they can’t get the men to fight because the men know that once they get assigned to that task their chances of living are small. And I, myself, believe that’s the only chance we have of winning this thing. And when they see they’re getting killed in such high rates in the South and they see that supplies are less likely to come down from the North, I think it will just hurt their morale a little bit more. And to me that’s the only way to win, because we’re not killing enough of them to make it impossible for the North to continue to fight. But we are killing enough to destroy the morale of those people down there if they think this is going to have to go on forever. PRESIDENT JOHNSON [SOT]: All right. Go ahead, Bob. ROBERT McNAMARA: Thanks. BILL MOYERS: Now, Secretary McNamara and President Johnson were talking about a different kind of bombing from the drones in Afghanistan and Pakistan and a lot more of it. But do you see a historical parallel there? MARILYN YOUNG: Oh, yeah. I mean, the notion that you will break the will of the enemy, I – that’s such a depressing clip. I just can’t – I mean, it just sinks me right back into the moment when all that was going on. Winston Churchill is held up as a great hero because he defies German bombing and says we will fight them everywhere. They can’t break our will. And he is considered a great hero. McNamara is incapable of reading that same spirit back into his enemy. Instead, he assumes that he can bomb them into submission. And it’s the same notion now that you can scare them, break their will. And the drone, this precise thing, is maybe, in the minds of those who use it, even more scary because you don’t see us but we see you. And zap we gotcha. But it’s, again, an effort to deal with a political issue with force. And it doesn’t work. BILL MOYERS: Pierre, as I said in the introduction, you helped develop a couple of very effective fighter planes. Is there a moral dimension to this use of drones that you didn’t see in a more conventional kind of weapon? PIERRE SPREY: There’s a moral dimension to every kind of bombing that destroys civilians, particularly bombing that destroys more civilians than military people. You can’t avoid it. There’s nothing notable about the drones that changes that. And the moral dimension is very simple. And it dates back to the original theologian of bombing, Julio Doue, a rather fanatical Italian from World War I who first hypothesized, wrongly, that you could destroy an enemy’s morale, exactly what you said, and win victories without any ground armies if you simply bombed them enough. And secondly, that the bombers would always get through, that they would always defeat fighter opposition and antiaircraft opposition. Both propositions have been provided in history over and over and over again to be not only wrong but thumpingly wrong. BILL MOYERS: Has civilian bombing ever been effective, Marilyn? MARILYN YOUNG: I can’t think. Can you? PIERRE SPREY: The answer is no. PIERRE SPREY: Very simply, no. BILL MOYERS: Here you say there are none. MARILYN YOUNG: No. I don’t think ever. PIERRE SPREY: You know? Churchill tried it. Churchill, by the way, after that brave stand to resist the Germans, turned around and, for politic reasons, just like our leaders, decided that it would be a great idea to simply area bomb Germany. What that means is to kill civilians. And they deliberately set out to kill German civilians on the same premise of Julio Doue that we would kind of kill them into submission. And it failed miserably. BILL MOYERS: Does it seem to you that President Obama believes he can escape the outcome in Afghanistan that George W. Bush did not escape in Iraq? MARILYN YOUNG: Right. I think he does think he can escape it. I think anybody would imagine coming into fresh into power would imagine he can make it happen better. If he didn’t believe that, he would not have said – he would not have signed off on the drone attack. So I think he thinks he can escape it. And by fiddling within the same set of tactics that the Bush administration did. And isn’t it any – there’s no new thinking going on. PIERRE SPREY: See, that’s the problem. BILL MOYERS: We couldn’t keep up with who we were getting rid of in Saigon, you know? I’m serious about that. PIERRE SPREY: It’s – same thing’s going to happen when we get rid of Karzai because the people behind him are worse. And they will be worse. And Obama is going to be in exactly that situation, surrounded by a bunch of Robert McNamaras, except not so smart. BILL MOYERS: So do you believe “The New York Times” was accurate the other day when it said Afghanistan could quickly come to define the Obama presidency? MARILYN YOUNG: I hope not. I cannot tell you how much I hope not. I think – he’s got so much he wants to do. And he has so many good things he wants to do. And he starts out, you know, really marvelously, trying to do those good things. And if he is deflected, as Johnson was, that would be, well, it’s this sort of tragedies that America’s good at. It turns out to be as much a tragedy for the people we’re supposedly engaged with as it is for us. PIERRE SPREY: I’m pessimistic on that. I’m more pessimistic than Marilyn. 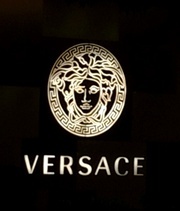 PIERRE SPREY: I think he will be trapped in it. I think. MARILYN YOUNG: I’m not, I knock wood a lot. PIERRE SPREY: He’s already so committed through his campaign of reinforcing Afghanistan and continuing the path we’ve been on unless he finds an act of enormous political will and courage and a way of explaining it to the American people that, you know, we’ve engaged on a path that’s wrong and that’s not going to work. And I’m about to reverse course. That’s really hard to do. PIERRE SPREY: And if he doesn’t reverse course, it’s the same quicksand. It’s deeper and deeper, step by step. MARILYN YOUNG: See, suppose that Osama bin Laden stayed where he was. Suppose he did. I mean, the acts of terror occur or they don’t occur and they’re deflected or they’re not deflected no matter where he’s living, right? MARILYN YOUNG: So the question of why we’re in Afghanistan looms very large indeed. MARILYN YOUNG: Since it doesn’t seem to relate in any way I can really name with precision American security. BILL MOYERS: Two important books, “Bombing Civilians: A 20th Century History,” with Marilyn Young, and “America’s Defense Meltdown: Pentagon Reform for President Obama and the New Congress,” with an important chapter from Pierre Sprey. Thank you both for being with me on the Journal. MARILYN YOUNG: Thank you, Bill. PIERRE SPREY: Thank you, Bill.